Objectives Hepatocellular carcinoma (HCC) is the second leading cause of cancer mortality worldwide. Alterations in microtubule-associated proteins (MAPs) have been observed in HCC. However, the mechanisms underlying these alterations remain poorly understood. Our aim was to study the roles of the MAP protein regulator of cytokinesis 1 (PRC1) in hepatocarcinogenesis and early HCC recurrence. Design PRC1 expression in HCC samples was evaluated by microarray, immunoblotting and immunohistochemistry analysis. Molecular and cellular techniques including siRNA-mediated and lentiviral vector-mediated knockdown were used to elucidate the functions and mechanisms of PRC1. Results PRC1 expression was associated with early HCC recurrence and poor patient outcome. In HCC, PRC1 exerted an oncogenic effect by promoting cancer proliferation, stemness, metastasis and tumourigenesis. We further demonstrated that the expression and distribution of PRC1 is dynamically regulated by Wnt3a signalling. PRC1 knockdown impaired transcription factor (TCF) transcriptional activity, decreased Wnt target expression and reduced nuclear β-catenin levels. Mechanistically, PRC1 interacts with the β-catenin destruction complex, regulates Wnt3a-induced membrane sequestration of this destruction complex, inhibits adenomatous polyposis coli (APC) stability and promotes β-catenin release from the APC complex. In vivo, high PRC1 expression correlated with nuclear β-catenin and Wnt target expression. PRC1 acted as a master regulator of a set of 48 previously identified Wnt-regulated recurrence-associated genes (WRRAGs) in HCC. Thus, PRC1 controlled the expression and function of WRRAGs such as FANCI, SPC25, KIF11 and KIF23 via Wnt signalling. 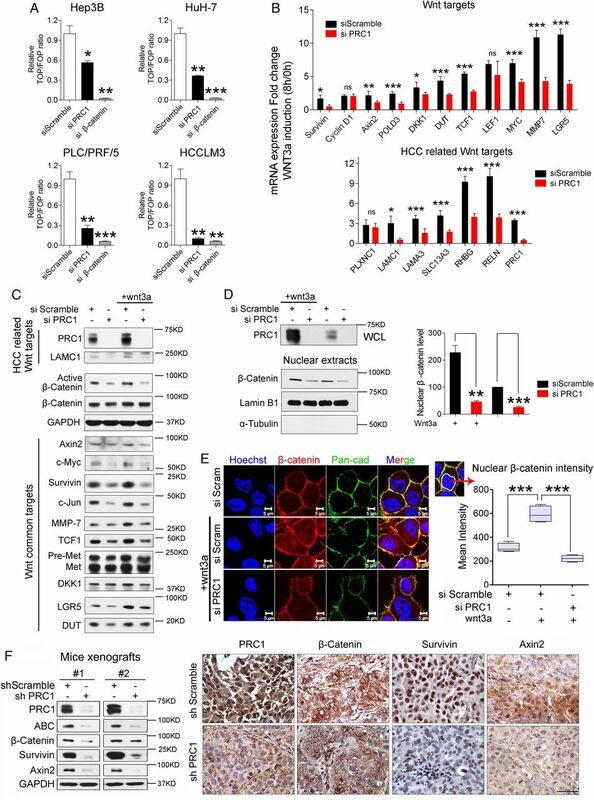 Conclusions We identified PRC1 as a novel Wnt target that functions in a positive feedback loop that reinforces Wnt signalling to promote early HCC recurrence. Early recurrence in human hepatocellular carcinoma (HCC) remains the major cause of death after potentially curative liver resection. 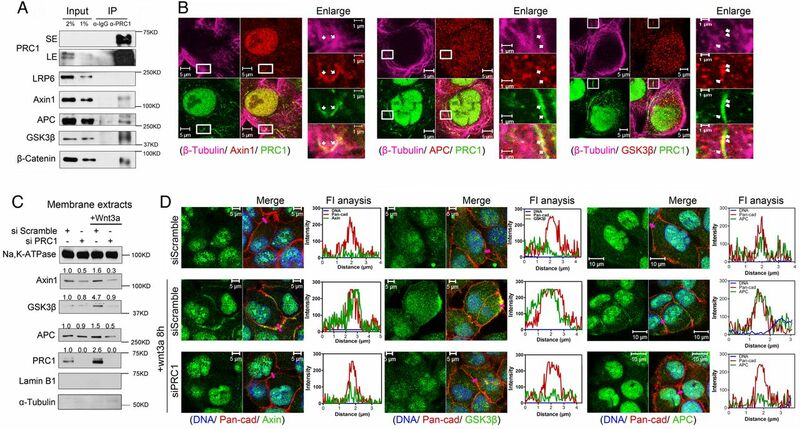 Protein regulator of cytokinesis 1 (PRC1) regulates antiparallel microtubule cross-linking to promote the formation of microtubule architectures to support cell shape and regulate cytokinesis. PRC1 has been reported to be upregulated in breast and bladder tumours. The Wnt-β-catenin network is enormously complex. Aberrant regulation of the canonical Wnt-β-catenin signalling pathway is associated with a variety of diseases, including cancer, fibrosis and neurodegeneration. There are two types of HCC in which β-catenin signalling are activated. In both cases, nuclear β-catenin is found with a specific transcriptional output. In the first type, this is due to CTNNB1 activating mutations and the HCCs are mostly well differentiated with a rather good prognosis: these tumours overexpress glutamine synthetase, which is a highly specific and highly sensitive marker of β-catenin mutation. The second type of tumours is Wnt-activated and is mostly not CTNNB1-mutated: they correspond to HCC with a poorer prognosis. PRC1 is upregulated in HCC, especially in early recurrent HCC. PRC1 has an oncogenic function in promoting cancer proliferation, stemness, metastasis and tumourigenesis. PRC1 is a direct Wnt signalling target, and its cytoskeletal localisation is dynamically regulated by Wnt3a activity. PRC1 is necessary for Wnt signalling to mediate oncogenesis and cancer stem cells self-renewal. PRC1 potentiates Wnt signalling by promoting the membrane sequestration of the Axin1 destruction complex, thereby reducing APC stability but stabilising β-catenin. 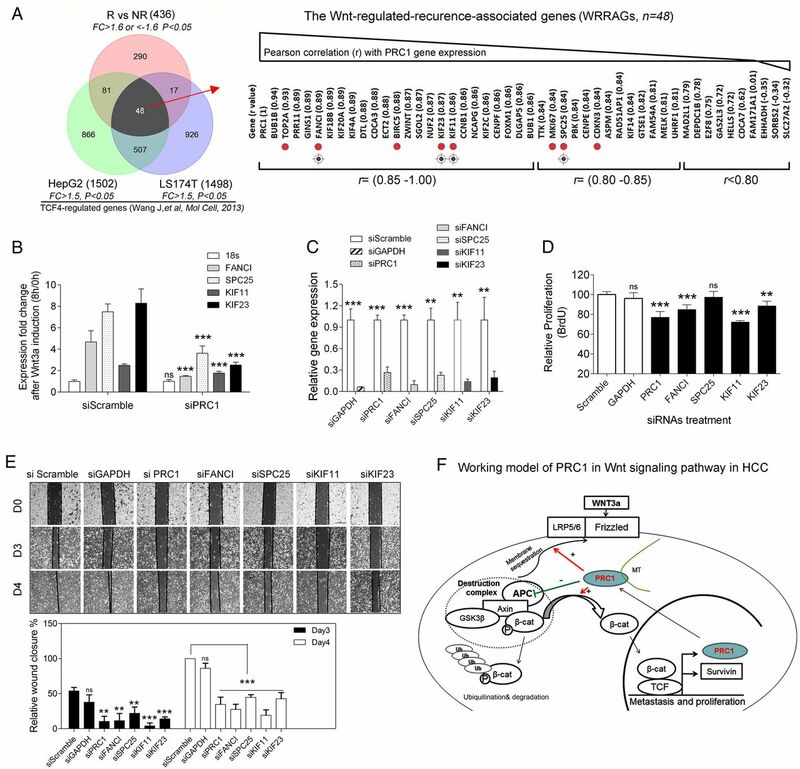 Wnt-regulated recurrence-associated genes (WRRAGs) were identified in HCC, and PRC1 regulated the expression of WRRAGs via Wnt signalling. The PRC1-coordinated WRRAG cluster might be useful as a predictor of the risk of early HCC recurrence and as an indicator of Wnt signalling activities. Abundant clinical evidence has implicated a critical role of aberrant canonical Wnt/β-catenin signalling in HCC initiation and development, underscoring the potential of targeting this pathway for the therapeutic intervention of this typically difficult-to-treat cancer. In this study, PRC1 emerged as a new therapeutic target, and its microtubule-binding domain could be targeted using small molecule inhibitors. Specific small molecule inhibitors or activators with defined targets and mechanisms would provide therapeutic leads for HCC and research tools to manipulate the Wnt pathway in precise temporal and spatial ways. Microtubules (MTs) play essential roles in cell cycle, trafficking, signalling and migration. Alterations in MT-associated proteins (MAPs) have been demonstrated in cancers, and these changes generally correlate with poor prognosis. A role for a divergent canonical Wnt pathway in regulating the MT cytoskeleton to promote cell movement has been suggested,21 implying that MAPs may be involved in Wnt signalling by interacting with Wnt components. This suggestion is supported by the observation that many Wnt pathway components, including APC, Axin1 and GSK3β, are associated with MTs.21 However, little is known about the molecular interplay between MAPs and Wnt signalling. Protein regulator of cytokinesis 1 (PRC1, also known as Ase1 (yeast)/MAP65 (plant)) is involved in cytokinesis22 and plays key roles in MT organisation in eukaryotes;23 ,24 however, its role in carcinogenesis is unknown. Here, we demonstrated the molecular interactions between the Wnt pathway and PRC1 in patients with HCC, cell lines and xenografts. Mechanistically, Wnt signalling stimulates PRC1 expression and modulates its cytoskeletal localisation. In turn, PRC1 regulates the membrane sequestration of the destruction complex and promotes APC degradation to stabilise β-catenin. Thus, we have identified PRC1 as a novel regulator that links Wnt signalling activation to the promotion of HCC recurrence. Additional materials and methods are provided in online supplementary information. Based on the results from data mining of our microarray database previously established,7 PRC1 expression was significantly upregulated in HCC tumours compared with histologically normal liver (NN) from colorectal cancer patients with liver metastases or matched adjacent histologically normal liver (MN) tissues (p<0.001; figure 1A, left panel). PRC1 expression in a subset of these samples was further validated by real-time PCR (see online supplementary figure S1A). In addition, PRC1 expression was markedly upregulated in tumours from patients with early (<2 years) recurrent disease (HCC-R) compared with samples from patients with no demonstrable evidence of recurrence within 5 years (HCC-NR) (p<0.001; figure 1A, right panel). PRC1 expression in a subset of these HCC-NR samples was also validated (see online supplementary figure S1B). Furthermore, data mining of RNA-seq data from HCC and adjacent matched tissues that are publically available in The Cancer Genome Atlas database confirmed that PRC1 expression is significantly elevated in tumours compared with matched normal tissues (p<0.001; figure 1B). Significantly higher PRC1 expression levels were detected in tumours exhibiting more frequent vascular invasion (see online supplementary figure S1C) and in those scored as high-grade cancer (see online supplementary figure S1D). Protein regulator of cytokinesis 1 (PRC1) is upregulated in hepatocellular carcinoma (HCC) and is related to early HCC recurrence. (A) Microarray assay of PRC1 expression in normal (NN), matched normal (MN), recurrent HCC (HCC-R) and non-recurrent HCC (HCC-NR) tissue. (B) PRC1 gene expression in The Cancer Genome Atlas (TCGA) RNA-seq database. (C) Representative immunohistochemistry (IHC) staining for PRC1 expression in HCC and matched normal (MN) tissues, and high-magnification images of representative IHC staining for PRC1 in MN, HCC-R and HCC-NR tissue. (D) The PRC1 expression intensity scores for 25 patient tissues, some of which include MN tissue (n=10). (E) Overall survival (OS) and (F) disease-free survival (recurrence) of the patients displaying high or low PRC1 expression. Similarly, assessment via immunohistochemistry (IHC) revealed that PRC1 was upregulated in HCC tumours (T) compared with MN tissues (figure 1C). 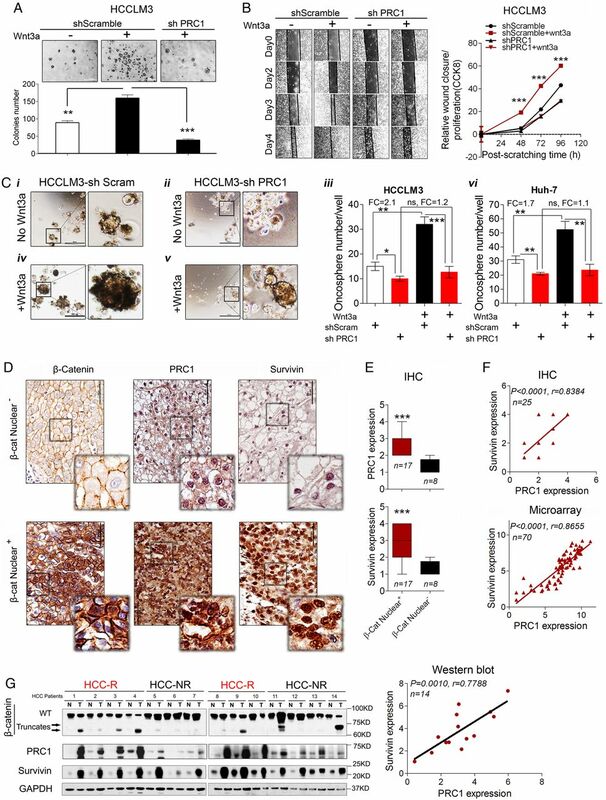 Moreover, PRC1 was highly expressed in HCC-R tissue compared with HCC-NR and MN tissues (figure 1C,D). Additionally, we studied the expression of PRC1 in 10 HCC cell lines, and all of them display elevated expression of PRC1 compared with MN tissues (see online supplementary figure S1E). Moreover, patients with HCC (the clinical characteristics are provided in online supplementary table S2) with higher than median PRC1 expression exhibited significantly shorter overall survival (p<0.0001; figure 1E) and recurrence-free survival duration (p=0.0019; figure 1F) than patients with lower PRC1 expression. More importantly, univariate and multivariate analyses indicated that PRC1 expression serves as an independent prognostic factor for recurrent HCC (see online supplementary table S3). Our data strongly suggest that elevated PRC1 expression induces enhanced oncogenic potency and is associated with an increased risk of HCC recurrence. To address the function of PRC1 in HCC, we first employed siRNAs to silence PRC1 expression in HCC cells (see online supplementary figure S2A). 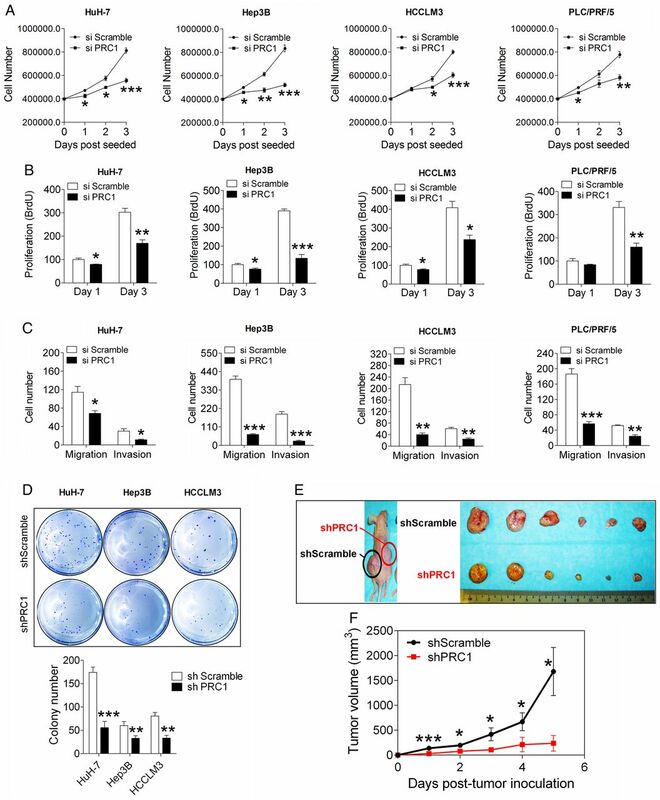 PRC1 knockdown significantly suppressed the growth kinetics of four HCC cells (figure 2A) and also suppressed their proliferation determined by BrdU incorporation (figure 2B). Moreover, PRC1 knockdown in Huh-7, Hep3B and HCCLM3 cells significantly increased the TUNEL-positive cell numbers (see online supplementary figure S2B,C) and activated caspase-3/7-positive apoptotic cells (see online supplementary figure S2D). Depletion of protein regulator of cytokinesis 1 (PRC1) suppresses the malignant properties of hepatocellular carcinoma (HCC) cells. (A) The growth curve and (B) the BrdU proliferation assay of four HCC cell lines after silencing PRC1 or applying a scramble control, n=5. (C) The transwell migration and invasion assays using four HCC cell lines after silencing PRC1 or applying a scramble control, n=3. (D) The soft agar colony formation assay following stable scramble treatment or PRC1 knockdown in three HCC cell lines, n=3. (E) Representative image and (F) growth curve of xenografts with stably PRC1-silenced or scramble control-treated HCCLM3 cells, n=8. The xenografts in the left and right flanks are labelled, indicating shScramble or shPRC1, respectively. Based on a transwell assay, PRC1 knockdown significantly inhibited the migration and invasion abilities of four HCC cell lines (figure 2C); these results suggest that PRC1 also regulates cell metastasis. To validate these observations, we generated cells exhibiting stable PRC1 knockdown (shPRC1) via lentivirus-mediated shRNA delivery (see online supplementary figure S2E), and we further validated the results in HCCLM3, a cell line with high metastatic potential. In a wound healing migration assay, shPRC1 HCCLM3 cells showed delayed wound healing closure compared with shScramble control HCCLM3 cells (see online supplementary figure S2F), thus confirming the ability of PRC1 to promote tumour metastasis in vitro. Moreover, according to a soft agar colony formation assay, shPRC1 cells showed markedly reduced colony number and size compared with the respective shScramble control cells (figure 2D). Furthermore, in a subcutaneous xenograft mouse model, shPRC1 HCCLM3 cells showed significantly delayed tumour growth compared with shScramble control cells (figure 2E,F). Our data demonstrated that PRC1 acts as an oncogenic driver of HCC. To identify the potential transcriptional regulators of PRC1, we analysed the PRC1 promoter (≈2 kb region) using PROMO software. We found one potential TCF4 binding site in this region, indicating that Wnt signal might drive PRC1 expression. To prove it, we first silenced endogenous β-catenin and TCF4 expression in HCC cells. Simultaneously silencing β-catenin and TCF4 markedly attenuated PRC1 expression (see online supplementary figure S3A,B). Then, dose titration of Wnt3a treatment demonstrated that a very low dose of Wnt3a (1.5625 ng/mL) triggers Wnt signalling activation in our cells. Immunoblotting for PRC1 and Wnt pathway components indicated that Wnt3a promoted the phosphorylation of the Wnt coreceptor LRP6 and increased the level of active β-catenin (ABC) (figure 3A). Concomitant with its induction of PRC1 expression, Wnt3a induced other known Wnt targets, including Survivin and cyclin D1 (figure 3A). Moreover, the induction of PRC1 mRNA expression by Wnt3a was confirmed and dramatically inhibited by depleting β-catenin or TCF4 (figure 3B). Protein regulator of cytokinesis 1 (PRC1) expression and cytoskeletal distribution are regulated by Wnt signalling in hepatocellular carcinoma (HCC) cells. (A) PRC1 and Wnt pathway component expression in three HCC cell lines after Wnt3a (1.5625 ng/mL) stimulation for 24 h. (B) The relative PRC1 gene expression level after silencing β-catenin or TCF4 followed by Wnt3a (1.5625 ng/mL) stimulation overnight. (C) PRC1 promoter analysis to identify the TCF4-binding site (TCF4 BS), as detected by the primer ‘PRC1’, or a negative control region, as detected by the primer ‘negative’. Real-time PCR analysis of the relative fold-enrichment of fragments on the PRC1 or Survivin promoter after 2 h of Wnt3a (1.5625 ng/mL) induction via ChIP using an anti-TCF4 antibody or IgG, n=5. (D) Western blot analysis of the expression of PRC1 and Wnt pathway components in HCCLM3 cells treated with different Wnt signalling inhibitors. (E) Cell fractionation analysis of the PRC1 cellular distribution and related markers after Wnt3a treatment (1.5625 ng/mL) in serum-starved HCCLM3 cells. (F) Immunofluorescence staining of PRC1 (green) and α-tubulin (red) in serum-starved HCCLM3 cells with or without Wnt3a treatment (1.5625 ng/mL, 8 h) (G) Representative confocal Z-stack images of immunofluorescence staining for PRC1 (green) and pan-cadherin (membrane marker, red) in serum-starved HCCLM3 cells with or without Wnt3a treatment (1.5625 ng/mL, 8 h). The white arrows indicate the colocalisation of PRC1 with membrane marker pan-cadherin. We further analysed the PRC1 promoter and designed the primers PRC1, which targeted the TCF4-binding site region, and negative, which targeted a random region not displaying TCF4 binding, for a ChIP assay (figure 3C). A primer detecting the TCF4 binding to the Survivin promoter was used as a positive control.26 Both real-time PCR and DNA gel assays of the ChIP products showed that Wnt3a stimulation for 2 h induced greater than twofold enrichment in TCF4 binding to the PRC1 promoter in HCCLM3 cells (see figure 3C and online supplementary figure S3C). Furthermore, we studied the effects of four inhibitors of various Wnt pathway components, including Dvl-PDZ domain inhibitor II (blocking the binding of Dvl2 to LRP6), XAV939 (inhibiting Tankyrase, thereby stabilising Axin1), lithium (suppressing GSK3β) and iCRT3 (disrupting the β-catenin-TCF4 interaction) (see online supplementary figure S3D). The results confirmed that Wnt signalling induced the expression of PRC1 in conjunction with other known Wnt targets in HCCLM3 cells (figure 3D). Because Wnt signalling has been shown to regulate the MT cytoskeleton that is also regulated by PRC1, we further investigated the potential effect of Wnt3a signal on PRC1 cellular distribution via cell fractionation and confocal microscopy assays. By cell fractionation assay, we found that Wnt3a dynamically induced the recruitment of PRC1 in the membrane, cytoplasm and cytoskeleton, but not the nuclear fraction (figure 3E). This phenomenon peaked approximately 8 h post-Wnt3a treatment. Upon costaining for endogenous PRC1 and either the MT marker α-tubulin or the membrane marker pan-cadherin, we confirmed that Wnt3a dynamically induced the enrichment of the PRC1 in MTs (figure 3F) and cell membranes (figure 3G). The discovery that Wnt3a dynamically regulates PRC1 cytoskeletal distribution suggests that PRC1 likely plays a role in Wnt signalling. To investigate the potential role of PRC1 in Wnt signalling, we first determined the endogenous Wnt/TCF activity in HCC cells. Unexpectedly, PRC1 knockdown significantly inhibited endogenous Wnt/TCF luciferase reporter activity, especially in HCCLM3 cells (figure 4A). Alternatively, exogenous Wnt3a-enhanced Wnt/TCF activity was completely suppressed by silencing PRC1 (see online supplementary figure S4A). We further studied 17 reported Wnt targets expression using real-time PCR by specific primers (see online supplementary table S4). Upon Wnt3a stimulation, PRC1 knockdown significantly inhibited the expression of 9 out of the 11 Wnt targets, including 5 out of the 6 HCC-related Wnt targets (figure 4B). Western blot analysis confirmed these results and demonstrated that silencing PRC1 markedly suppressed both endogenous and exogenous Wnt signalling by suppressing ABC and Wnt target expression in HCCLM3 and Huh-7 cells (see figure 4C and online supplementary figure S4B). Loss of protein regulator of cytokinesis 1 (PRC1) impairs Wnt/β-catenin signalling in hepatocellular carcinoma (HCC). (A) The changes in endogenous Wnt/TCF reporter activity in four HCC cell lines after silencing PRC1 or β-catenin gene expression or applying the scramble control, n=3. (B) The differences between the scramble control treatment and silencing PRC1 on Wnt target expression after 8 h Wnt3a (1.5625 ng/mL) of induction in HCCLM3 cells based on real-time PCR, n=5. (C) Western blot analysis of the level of PRC1, β-catenin activation and Wnt targets in cells after applying the scramble control or silencing PRC1 with or without Wnt3a treatment (12.5 ng/mL) overnight. (D) Western blot analysis (Lamin B1: nuclear protein marker, α-tubulin: cytoplasmic protein marker), and (E) immunofluorescence staining for nuclear β-catenin after applying the scramble control or silencing PRC1 in HCCLM3 cells with or without Wnt3a treatment (1.5625 ng/mL) for 8 h. β-Catenin is labelled in red, and the membrane marker pan-cadherin is labelled in green. The mean intensity of β-catenin staining in the cell nucleus, as indicated by the white circular lines, was determined using an LSM510 confocal microscope, n=30. (F) Western blot and immunohistochemistry (IHC) staining for PRC1, β-catenin, Survivin and Axin2 expression in xenograft tumours from HCCLM3 cells stably transfected with either shScramble or shPRC1. Based on the observed effect of silencing PRC1 on activated β-catenin levels, we further investigated the effect of PRC1 on β-catenin nuclear translocation. The results obtained from nuclear extraction and immunofluorescence indicated that PRC1 knockdown impaired the nuclear accumulation of β-catenin (figure 4D,E). In shPRC1 stable knockdown cells, Wnt signalling activity was also markedly attenuated (see online supplementary figure 4C,D). Moreover, the shPRC1 HCCLM3 xenografts displayed lower expression levels of ABC, β-catenin, and the Wnt targets Survivin and Axin2 than shScramble xenografts based on both western blot and IHC assays (figure 4F). Our results confirmed that PRC1 is essential for Wnt signalling activation in HCC. The finding that silencing PRC1 reduced the ABC levels indicates that PRC1 may act upstream of β-catenin. To test this hypothesis, we studied Wnt/TCF activities following overexpressing constitutively activated β-catenin (*β-catenin, harbouring mutations at specific phosphorylation sites) (see online supplementary figure S5A, top panel), or following treatment with the inhibitor iCRT3, which blocks the β-catenin–TCF interaction (see online supplementary figure S5A, bottom panel). Both *β-catenin overexpression and iCRT3 treatment abolished the effect of PRC1 depletion on Wnt/TCF activity (see online supplementary figure S5A). We further studied HepG2 cells expressing β-catenin harbouring an N-terminal deletion.27 Interestingly, in HepG2 cells PRC1 depletion did not alter Wnt targets expression or endogenous Wnt/TCF activity (see online supplementary figure S5B) and also did not significantly suppress the proliferation, migration and invasion in HepG2 cells (see online supplementary figure S5C). Our results suggest that PRC1 acts upstream of β-catenin. In addition, we used Wnt inhibitor XAV939, which was reported to stabilise Axin1 by suppressing Tankyrase activity.28 XAV939 dose-dependently stabilised Axin1 and increased Tankyrase expression, and also antagonised endogenous Wnt/TCF activity in HCCLM3 cells (see online supplementary figure S5D). However, silencing PRC1 ameliorated the Axin1 stabilisation and the Wnt/TCF activity suppression by XAV939 (see online supplementary figure S5D); this finding indicated that PRC1 regulates Axin1 probably on Tankyrase level. In addition, compared with siScramble treatment, silencing PRC1 did not alter endogenous Wnt/TCF activity in HCCLM3 cells treated with LiCl (a GSK3β inhibitor) or NaCl (a common used control) (see online supplementary figure S5E). This result further indicated that PRC1 likely acts upstream of GSK3β. Previously, we demonstrated that PRC1 targets Wnt signalling from Axin1 to GSK3β/β-catenin (see online supplementary figure S5), indicating that PRC1 modulates the destruction complex. To further address this regulatory mechanism and to determine whether PRC1 is in the destruction complex, we performed endogenous immunoprecipitation (IP) assays using an anti-PRC1 antibody. Unexpectedly, in the PRC1-associated IP complex, we detected the main components of the destruction complex, including Axin1, APC, GSK3β and β-catenin, but did not detect the coreceptor LRP6 (figure 5A). Next, we constructed full-length PRC1 and three truncation mutants fused to enhanced green fluorescent protein (EGFP) as described previously.23 They are tentatively termed PRC1-FL, -ΔC (lacking the C-terminus), -CC (coiled-coil domain lacking the MT-binding domain and the C-terminus, which are important for the localisation of PRC1 to MTs) and -ΔCC (lacking the coiled-coil domain) (see online supplementary figure S6A). Transient expression of these constructs demonstrated that only PRC1-CC expression impaired the PRC1 MTs localisation (see online supplementary figure S6B). Based on GFP-Trap IP, we detected all PRC1 constructs except for the PRC1-CC construct in association with the Axin1/APC/GSK3β destruction complex (see online supplementary figure S6C), thus demonstrating that PRC1 interacts with the destruction complex via its MT-binding domain. Based on immunofluorescence triple staining, we detected that endogenous MT PRC colocalised with destruction complex core scaffold protein—Axin1 by MT-like structure and with APC or GSK3β by punctiform structures upon Wnt3a treatment (figure 5B). We also detected nuclear colocalisation of PRC1 and Axin1, indicating a possible role of nuclear PRC1 in Wnt signalling. To further investigate the PRC1 nuclear role, we constructed two mutants harbouring the mutations in PRC1 nuclear localisation signal (NLS), named NLS-2A and NLS-3A (see online supplementary figure S6D). Immunofluorescence staining of the transient expression of the NLS mutants showed that markedly attenuated nuclear PRC1 localisation for NLS-2A and completely depleted nuclear PRC1 localisation for NLS-3A in HCCLM3 (see online supplementary figure S6E). We further employ a siRNA targeting PRC1 mRNA 3′-untranslated region (UTR) region to deplete the endogenous PRC1 (see online supplementary figure S6F), and then we cotransfected two NLS mutants together with the Wnt reporters in PRC1-depleted cells. As expected, FL-PRC1 expression could rescue the attenuated Wnt reporter activity (see online supplementary figure S6G), while NLS-2A and NLS-3A expression also rescue the attenuated Wnt activity (see online supplementary figure S6G). This indicated that PRC1 regulated Wnt signalling mainly outside of the nucleus. Protein regulator of cytokinesis 1 (PRC1) is associated with the β-catenin destruction complex and regulates the membrane sequestration of the destruction complex in hepatocellular carcinoma (HCC). (A) Endogenous coimmunoprecipitation analysis of destruction complex proteins and LRP6, which were pulled down using IgG or an anti-PRC1 antibody, in Wnt3a-treated (1.5625 ng/mL, 4 h) HCCLM3 cells. SE, short exposure; LE, long exposure. (B) Immunofluorescence costaining for PRC1 (green) and Axin1, GSK3β or APC (red) together with microtubules (stained by Alexa Fluor 647 Mouse anti-β-Tubulin, far red) in Wnt3a-treated HCCLM3 cells (1.5625 ng/mL, 8 h treatment after serum starvation overnight). The white arrows show the colocalisation on microtubules (MTs). (C) Western blot assay of the expression of Axin1/APC/GSK3β destruction complex proteins in membrane extracts from HCCLM3 cells transfected with scramble or PRC1 siRNA with or without Wnt3a stimulation (1.5625 ng/mL, 4 h, no serum starvation); Na/K-ATPase (a membrane marker), α-tubulin (a cytoplasm marker) and Lamin B1 (a nuclear marker) were also shown. (D) The immunofluorescence costaining of the membrane marker pan-cadherin with Axin1, GSK3β and APC in HCCLM3 cells transfected with scramble or PRC1 siRNA with or without Wnt3a stimulation (1.5625 ng/mL, 8 h, after serum starvation overnight) to indicate the membrane sequestration of the Axin1 scaffold-mediated destruction complex. The fluorescence intensities (FI) on each pixel along the purple lines crossing the membranes were calculated to show the colocalisation of destruction proteins with membrane protein marker-pan-cadherin. Membrane sequestration of the destruction complex upon Wnt stimulation reduces the availability of cytoplasmic destruction complexes, thereby causing β-catenin accumulation.18 To investigate whether PRC1 can modulate the membrane sequestration of the destruction complex, we purified the membrane fraction and determined that Wnt3a induced the membrane enrichment of destruction complex components including GSK3β, Axin1, APC and PRC1, whereas silencing PRC1 impaired the membrane enrichment of these proteins upon Wnt3a induction (figure 5C). In addition, immunofluorescence and fluorescence intensity assays indicated that Wnt3a indeed triggered the membrane enrichment of Axin1 and its associated APC and GSK3β. In contrast, silencing PRC1 markedly reduced the membrane sequestration of these proteins (figure 5D). Upon Wnt signalling inactivation, APC facilitates the capture of free β-catenin for phosphorylation and degradation. To investigate the effects of PRC1 on β-catenin stability, we performed a cycloheximide chase assay. As expected, silencing PRC1 facilitated the destabilisation of β-catenin. Unexpectedly, silencing PRC1 promoted the stabilisation of APC (figure 6A) but not of the other destruction complex components. Furthermore, Wnt3a stimulation triggered cytoplasmic β-catenin stabilisation (by 1.0–2.2-fold; see online supplementary figure S7A), but silencing PRC1 markedly suppressed Wnt3a-mediated β-catenin stabilisation (by 0.9–0.7-fold; see online supplementary figure S7A). These results suggested that the accelerated degradation of β-catenin caused by PRC1 depletion likely resulted from the stabilisation of APC. 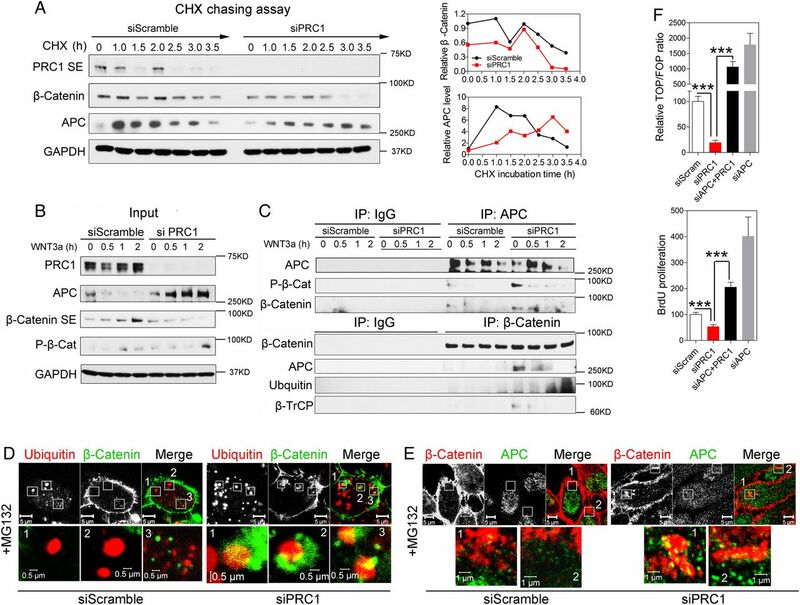 Protein regulator of cytokinesis 1 (PRC1) promotes β-catenin stabilisation and activity by suppressing APC stability and blocking its binding to β-catenin. (A) Western blot and quantification analyses of the effect of the depletion of PRC1 on β-catenin or APC stability in HCCLM3 cells treated with cycloheximide (CHX) at different time points. SE, short exposure. (B) Western blot (SE) and (C) coimmunoprecipitation assays of the effect of silencing PRC1 on the Wnt3a-induced (1.5625 ng/mL) dynamic dissociation of β-catenin from the APC degradation complex in HCCLM3 cells. Immunofluorescence staining for β-catenin and (D) ubiquitin or (E) the APC complex scramble-treated or PRC1-silenced HCCLM3 cells treated with MG132 for 2 h. (F) The TOP/FOP Wnt/TCF activity and BrdU proliferation assays in HCCLM3 cells treated with the indicated siRNAs, n=4. To further demonstrate how PRC1 modulates the dynamic process of APC/β-catenin complex activity, we performed endogenous Co-IP assays in HCCLM3 cells stimulated with Wnt3a (figure 6B,C). Upon Wnt3a stimulation, APC rapidly degraded (figure 6B). In comparison, depleting PRC1 impaired APC degradation and even stabilised APC, which ultimately caused the phosphorylation and degradation of β-catenin (figure 6B). Co-IP using an anti-APC antibody further indicated that silencing PRC1 accelerated the capture and phosphorylation of β-catenin by the APC complex (figure 6C). Moreover, co-IP using an anti-β-catenin antibody indicated that silencing PRC1 enhanced the binding of β-catenin to APC and to the ubiquitin ligation complex composed of β-TrCP and ubiquitin (figure 6C). This observation was further validated by immunofluorescence staining, which demonstrated that PRC1 knockdown markedly increased the colocalisation of β-catenin with ubiquitin (figure 6D) and APC complex (figure 6E). To confirm whether PRC1 physically blocked APC binding to β-catenin, we transiently expressed the PRC1-FL construct in HCCLM3 cells and then performed co-IP using an anti-APC antibody. PRC1-FL expression could block the binding of APC to β-catenin in a dose-dependent manner (see online supplementary figure S7B). 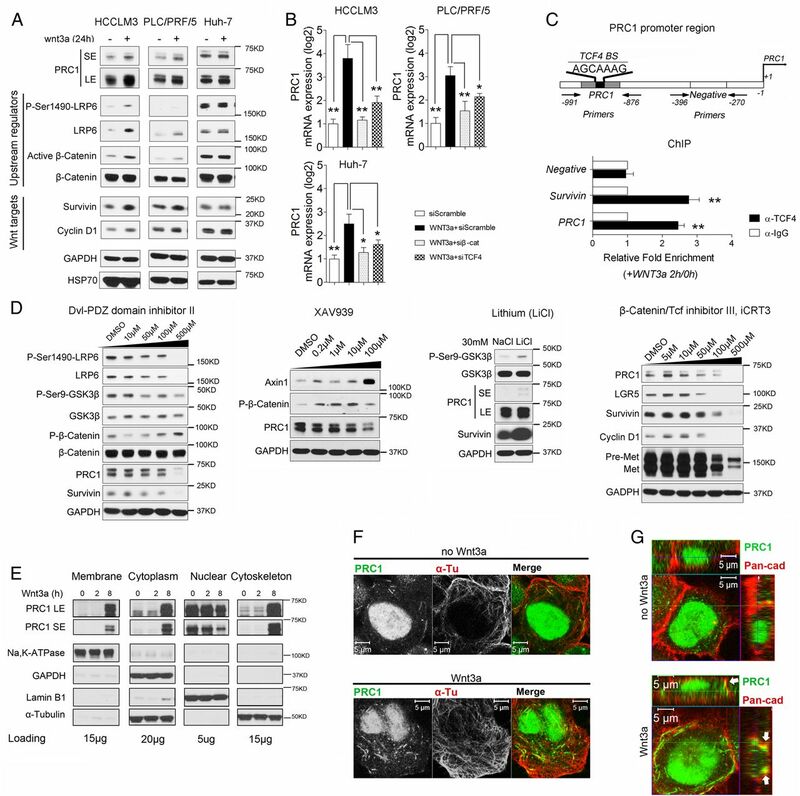 To ensure that APC performs its tumour suppressor function in HCCLM3 cells, we silenced APC (see online supplementary figure S7C) and investigated Wnt/TCF activity and cell proliferation. Silencing APC promoted Wnt/TCF luciferase activity and cell proliferation, whereas silencing PRC1 induced the opposite effects (figure 6F). Simultaneously silencing APC and PRC1 could significantly rescue the inhibitory effect of PRC1 knockdown (figure 6F), indicating that PRC1 potentiates Wnt signalling primarily by suppressing APC function. Oncogenic activation of Wnt signalling is common in HCC. To investigate Wnt3a signalling function in HCC, a soft agar colony formation assay and a modified wound healing assay were used in HCCLM3 cells. Wnt3a significantly promoted colony formation and migration, but PRC1 knockdown completely blocked Wnt3a-induced colony formation (figure 7A) and migration (figure 7B). 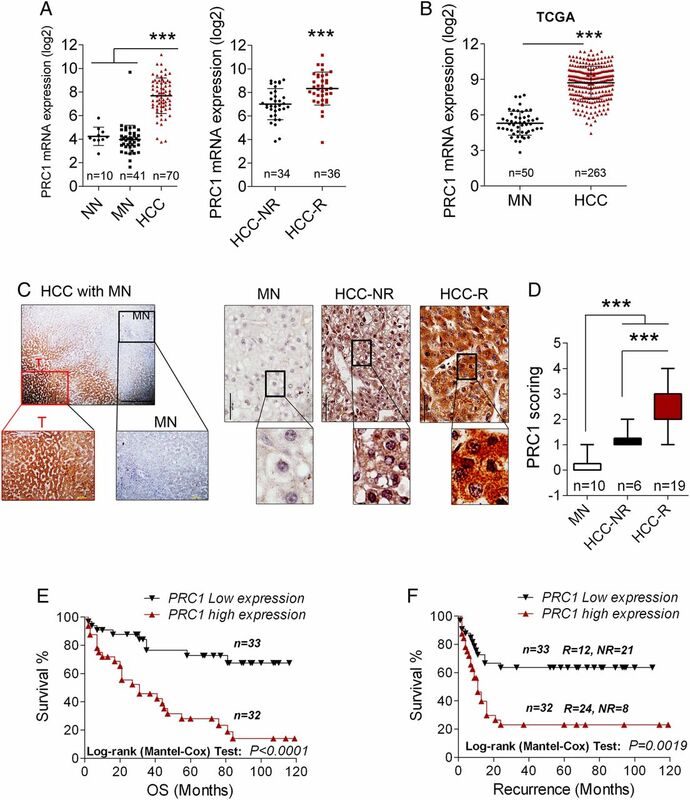 Loss of protein regulator of cytokinesis 1 (PRC1) impairs oncogenic Wnt signalling function, and PRC1 expression is associated with high Wnt potency in hepatocellular carcinoma (HCC) patient tissues. (A) The soft agar colony formation assay (n=3, wnt3a dose: 1.5625 ng/mL) and (B) the modified wound healing assay (wound closure/proliferation by CCK8 assay) of HCCLM3 cells stably transfected with scramble or PRC1 shRNA with or without Wnt3a (1.5625 ng/mL) stimulation in 1% fetal bovine serum (FBS) medium. Relative wound healing was determined using ImageJ software National Institutes of Health ((NIH), USA), n=5 and relative proliferation was detected by CCK8 assays in the same condition as wound healing assay. (C) PRC1 knockdown inhibits oncosphere formation by HCCLM3 and Huh-7 cells and suppresses Wnt3 (1.5625 ng/mL)-induced oncosphere formation. Representative sphere formation images are shown. Scale bar, 500 μm. Sphere-forming cells in 24-well plates were counted, n=3. Spheres (>100 μm) were counted and analysed using ImageJ software. (D) Immunohistochemistry (IHC) staining and (E) the quantification of PRC1 and Survivin expression in patient tissues that were positive or negative for nuclear β-catenin expression (n=25). (F) The correlation the Wnt targets PRC1 and Survivin based on IHC and microarray assays. (G) Western blot and correlation analysis of PRC1 and Survivin expression in 14 individual paired HCC patient tissues. Wnt signalling regulates liver cancer stem cell (CSC) self-renewal.29 Thus, we further sought to establish whether PRC1 regulates liver CSCs. We studied the effect of PRC1 on the oncospheres formation. HCCLM3-shScram cells formed oncospheres. In comparison, oncosphere formation was significantly attenuated in shPRC1 HCCLM3 cells (figure 7Ci–iii). Moreover, Wnt3a markedly promoted oncosphere formation by HCCLM3-shScram cells (figure 7Ci, iii and iv) but failed to promote oncosphere formation by shPRC1 HCCLM3 cells (figure 7Ciii–v). Similar results were obtained for Huh-7-shScram and shPRC1 Huh-7 cells (figure 7Cvi), thus indicating that PRC1 promotes liver CSC self-renewal via Wnt signalling. To evaluate the potential correlation of PRC1 expression with Wnt activity in vivo, we first investigated the expression of PRC1, β-catenin and a Wnt target-Survivin by IHC. IHC of consecutive tumour sections from 25 independent HCC patients (whose clinical characteristics are presented in see online supplementary table S5) demonstrated that tumours displaying nuclear β-catenin expression exhibited significantly higher levels of PRC1 and Survivin expression (p<0.001) compared with tumours lacking nuclear β-catenin expression (figure 7D,E). Then, PRC1 expression significantly correlated with Survivin expression based on IHC (r=0.8384, p<0.001) and microarray analysis (r=0.8655, p<0.001) (figure 7F). Furthermore, immunoblotting performed on 14 paired tumours and MN tissues (including seven paired early recurrent HCC tissues and seven paired non-recurrent HCC tissues; see online supplementary table S6 and figure 7G) showed that PRC1 was highly expressed in early recurrence HCC tissues compared with non-recurrent ones. PRC1 expression by immunoblotting also significantly correlated with Survivin expression (r=0.7788, p=0.0010, n=14) (figure 7G). This result implies that PRC1 expression correlates with the activation of the Wnt signalling pathway in vivo. To evaluate the role of Wnt signalling in early HCC recurrence, we identified potential WRRAGs by analysing the genes identified in both our HCC early recurrence gene database (fold change (FC)>1.6, p<0.05)7 and the reported Wnt/TCF4-regulated gene database (FC>1.5, p<0.05) in HepG2 and LS174T cells.30 Forty-eight candidates were identified. Surprisingly, the expression of 43 of them (∼90%) correlated with PRC1 expression (r>0.7, p<0.05, figure 8A). Identification and characterisation of Wnt-regulated recurrence-associated genes (WRRAGs); protein regulator of cytokinesis 1 (PRC1) regulates WRRAG expression and function via Wnt signalling. (A) Venn diagram analysis of the screening of 48 WRRAGs. The 48 genes were arranged according to the results of their Pearson correlation (r) with PRC1 gene expression. An r from 0.85 to 1.00 indicates correlated very strong correlation, and an r from 0.80 to 0.85 indicates a strong correlation. The red solid circles indicate genes validated as recurrence-associated genes based on recurrence-free survival analysis, and the bulls-eye symbol indicates the genes selected for Wnt3a target analysis and for in vitro functional studies. (B) The fold changes in the expression of 18S (negative control), FANCI, SPC25, KIF11 and KIF23 induced by treatment with Wnt3a (1.5625 ng/mL) for 8 h in HCCLM3 cells treated with scramble or PRC1 siRNA. (C) The knockdown efficiency of siRNAs targeting GAPDH, PRC1, FANCI, SPC25, KIF11 and KIF23 relative to the scramble control in HCCLM3 cells 40 h post treatment. (D) The BrdU proliferation assay and (E) the wound healing migration assay in HCCLM3 cells (1% FBS) treated with Scramble, GAPDH, PRC1, FANCI, SPC25, KIF11 or KIF23 siRNA. (F) A proposed working model of PRC1 functions in the Wnt pathway in hepatocellular carcinoma (HCC). Wnt3a signalling induces the expression and microtubule (MT) enrichment of PRC1, which can promote the membrane sequestration of the destruction complex, suppress APC stability, accelerate active β-catenin release from the APC complex and promote HCC metastasis and proliferation. To establish a link between the WRRAGs and PRC1, we randomly selected five genes, viz. TOP2A, FANCI, BIRC5, KIF23 and KIF11, among the very strongly correlated genes (r=0.85–1.00) and three genes, viz. MKI67, SPC25 and CDKN3, among the strongly correlated genes (r=0.80–0.85) for recurrence-free survival analysis (see online supplementary figure S8). Elevated expression of all selected WRRAGs was significantly associated with poor recurrence-free survival (see online supplementary figure S8). To validate these WRRAGs as potential Wnt targets that might be regulated by PRC1, four genes, viz. FANCI, KIF23, KIF11 and SPC25, were selected for Wnt3a induction and functional assays in HCCLM3 cells. Wnt3a markedly induced the four genes expression compared with the 18S control (figure 8B), but PRC1 knockdown significantly attenuated the Wnt3a-induced expression of these genes (figure 8B), indicating that PRC1 potentially regulates WRRAGs expression via Wnt signalling. To further verify these WRRAGs functions, we knocked down their gene expression by siRNAs (figure 8C). Subsequently, BrdU proliferation and wound healing migration assays were employed for functional studies, which confirmed that FANCI, KIF11 and KIF23 promoted cell proliferation (figure 8D) and that all four genes promoted cell metastasis (figure 8E). Taken together, our data indicate that Wnt signalling regulates the expression and cytoskeletal localisation of PRC1 to potentiate the Wnt signalling by promoting the membrane sequestration of the destruction complex, inhibiting APC and blocking the β-catenin binding to APC complex, which indicates a Wnt/PRC1-positive regulatory loop that drives HCC metastasis and recurrence (figure 8F). The prognosis of HCC remains dismal, and our knowledge of the underlying cellular and molecular pathways driving its pathogenesis is limited. In this study, we verified that PRC1 is significantly upregulated in HCC tumours and that its expression is strongly associated with early HCC recurrence. We further demonstrated that PRC1 plays oncogenic roles in association with the canonical Wnt signalling in HCC cells and that PRC1 could determine the fate of CSCs during hepatocarcinogenesis. The canonical Wnt (Wnt/β-catenin) signalling pathway controls many biological processes, including cell fate determination, proliferation and stem cell maintenance.31–33 Canonical Wnt ligands bind to the frizzled (FZD) and LRP5/6 coreceptor complex to activate downstream Wnt signalling.8 Aberrant activation of the canonical Wnt signalling is frequently observed in HCC.11 ,33 ,34 High nuclear β-catenin35 and c-Myc expression36 ,37 correlated with vascular invasion and reduced recurrence-free survival, suggesting the involvement of Wnt signalling activation in promoting HCC recurrence. High glutamine synthetase (GS) staining has been reported to correlate with β-catenin mutations in HCC.38 Using GS staining, there was no detectable difference between recurrent and non-recurrent HCCs (see online supplementary figures S9A,B and table S7), suggesting that β-catenin mutation is not a crucial factor for early recurrence and this corroborated with the results of Hoshida et al,39 demonstrating that β-catenin mutations were not found in a subclass of HCC associated with a greater risk of recurrence. An important finding of this study is the discovery that PRC1 is a novel regulator of early HCC recurrence via potentiating Wnt signalling. This finding could partially explain the observation of high nuclear β-catenin in recurrent HCC with wild-type β-catenin.39 Moreover, the HCC cell lines tested in this report did not respond equally to Wnt3a and/or PRC1 inhibition. This could likely be due to the different composition of Wnt receptor patterns and/or the mutations of Wnt downstream components. Another intriguing finding is the identification of PRC1 as a MAP that can potentiate Wnt signalling via its cytoskeletal localisation. This concept was supported by the observation that many Wnt pathway components, such as APC, Dvl and GSK3β, can act locally via their association with the cytoskeleton.21 Moreover, MACF1, a multidomain protein that associates with MTs and actin filaments, is present in the destruction complex and required for the translocation of Axin to the membrane to bind to LRP6.40 Recruitment to MTs is a well-documented function of PRC1 in mitosis and to a lesser extent in interphase via bundling of antiparallel MTs. We noticed that stimulating the Wnt pathway also causes the recruitment of the destruction complex to MTs in HCC cells. In addition, the kinesin motors included in WRRAG list that are under the control of Wnt activation in HCC also play a major role in spindle elongation by sliding antiparallel MTs. We therefore speculate that MT regulators may coordinately regulate the Wnt signalling via MT localisation. Indeed, some kinesins within the WRRAGs have previously been implicated in Wnt signalling.41 Hence, further research efforts in identifying potential drug targets to disrupt PRC1 MT localisation could provide a novel therapeutic strategy to improve HCC treatment. The authors thank the SingHealth Tissue Repository (STR) for the tissue samples.
. Proteomic screening of anaerobically regulated promoters from Salmonella and its antitumor applications. Mol Cell Proteomics 2011;10:M111. Contributors JC, MJ, HX, XZ, AD and SK performed the experiments and JC, MJ, HX, XZ, AD, SK, BKPG, LLO, WH and KMH analysed the data. XZ was involved in the generation of the sh-stable clones. KS and VPS performed the bioinformatics analysis and statistics analysis. JC, BKPG, LLO, WH and KMH designed the project, JC and KMH wrote the manuscript. Funding This work was supported by grants from the National Medical Research Council of Singapore (to LLO and to KMH) and from the SingHealth Foundation (to JC).